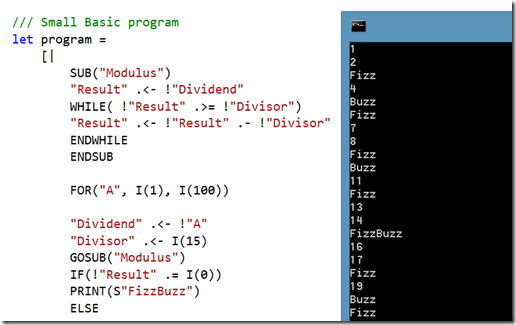 Microsoft’s Small Basic is a minimal implementation of the BASIC programming language using only 14 keywords. It’s aimed at beginners with a very simple development environment and library. My kids have enjoyed playing with it particularly the Turtle API which are reminiscent of Logo. Small Basic programs can be run locally, online via Silverlight or migrated to full fat Visual Basic .Net. I’m quite interested in building Domain Specific Languages (DSLs), including embedded DSLs, parsers and compilers. For a short exercise/experiment I wanted to recreate a simple imperative language and Small Basic looked like a fun option. I started by sketching out an abstract syntax tree (AST) for the language which describes the values, expressions and instructions. A parser or embedded DSL can be used to generate an AST for a program. The AST can then be evaluated by an interpreter, or transformed by a compiler to processor instructions, byte code or even another language. This can be used to specify a Small Basic program. Defining the embedded DSL in F# only took minutes using the interactive REPL environment and looks quite close to the target language. The AST, embedded DSL and interpreter are available as an F# snippet that you can run in F# interactive or build as an executable. 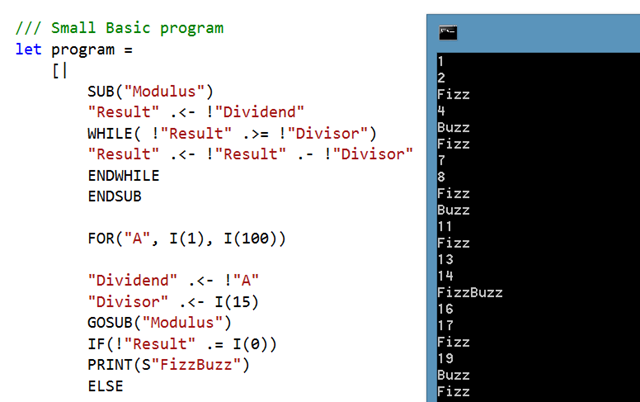 The script includes a Small Basic FizzBuzz sample.